Access to our members only email list. You will receive an email each Monday with the week's events and any last minute information. The right to participate in events at the lowest available price. If you would like to join WON but prefer to mail in a check, then download and print the membership form. All WON activities and events are NO SMOKING. Please respect your fellow members by refraining from smoking in or around functions being held. 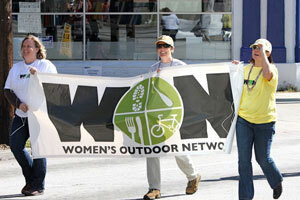 © 2010- Women's Outdoor Network. All Rights Reserved. Web Design by DaLee & Company, Inc.